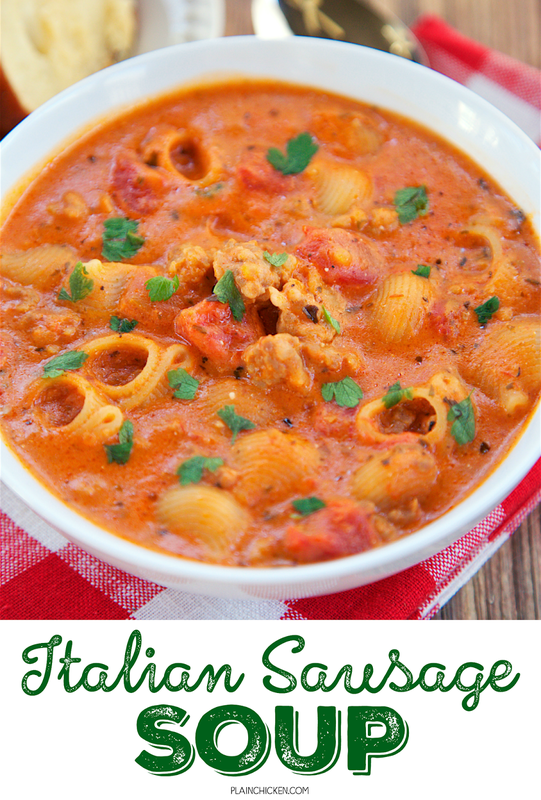 Italian Sausage Soup - ready in 30 minutes! Everything cooks in the same pot, including the pasta. Italian sausage, chicken broth, spaghetti sauce, cream cheese, pasta, oregano and basil. SO good! We ate this two days in a row. 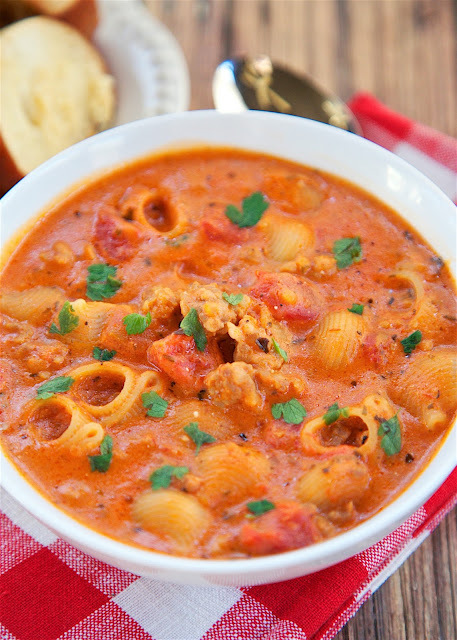 Serve with some crusty garlic bread for a complete meal!! 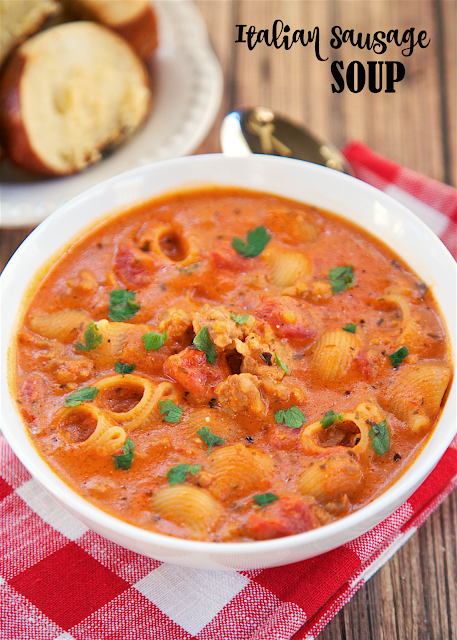 I made this Italian Sausage Soup the other day for lunch and it was a huge hit. Chicken Legs took one bite and was in food heaven! I must agree that this soup is really, really good. I love Italian food, so this was right up my alley. We served the soup with some crusty garlic bread. Perfect! 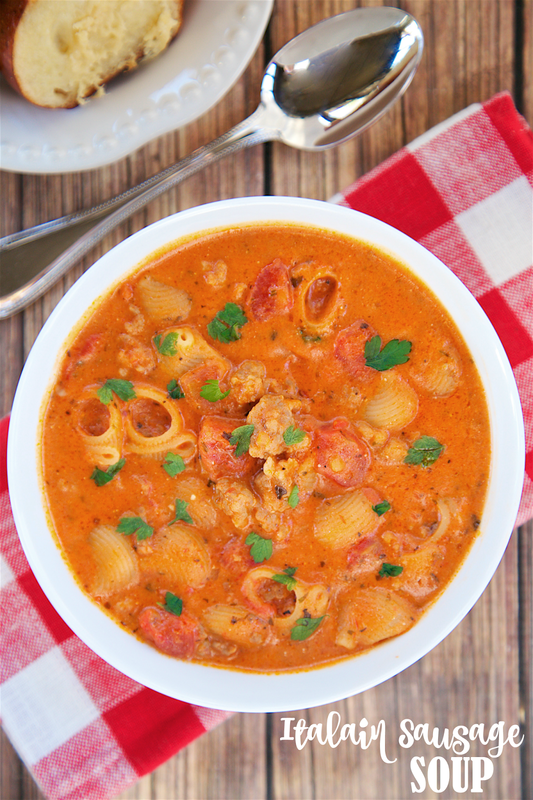 This Italian Sausage Soup only takes about 30 minutes to make from start to finish. You can't beat that! Cook the sausage, dump everything else in the pot and simmer. Everything cooks in the same pot - including the pasta! I love one-pot dishes! Makes for an easy cleanup. We had this for lunch two days in a row. SO good! In a Dutch oven on medium-high heat, cook Italian sausage until no longer pink. Drain fat. Add garlic and cook for 30 to 60 seconds. Add dried onion flakes, spaghetti sauce, oregano, red pepper, black pepper and salt. Bring to a boil, reduce heat and simmer for 10 minutes. Add pasta and cook for an additional 10 to 15 minutes. Stir in cream cheese, cook for 5 minutes. Spoon into bowls and garnish with fresh basil. I will be making this soon for sure, oh boy! If using fresh onion instead of dried minced onion, would you recommend sauteeing or sweating the onion first? I don't have a bottle of dried, but maybe I should? Yes - cook the onions in some oil until translucent. Enjoy!! This doesn't seem like it has enough liquid to cook the pasta. Do I need to add some water? Making it now and wonder the same thing. Will post if I have to add water. I had to add 2 cups of water. The consistency when finished wasn't really a soup, though, more like a thick stew. So maybe more water or more spaghetti sauce would be needed. Great flavor though. What kind of spaghetti sauce did you use?? ?